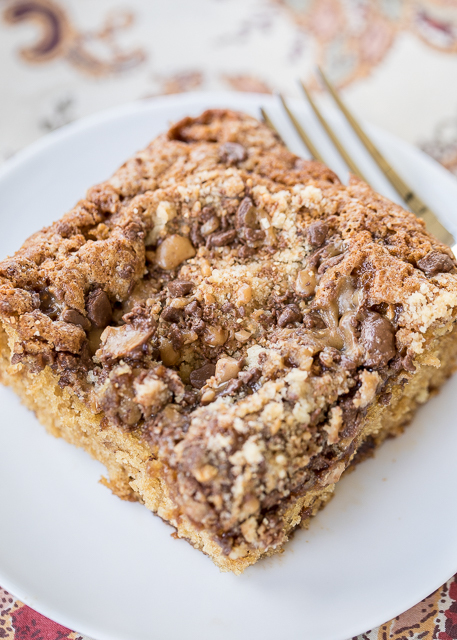 Toffee Streusel Coffee Cake - CRAZY good!! Our favorite coffee cake recipe! 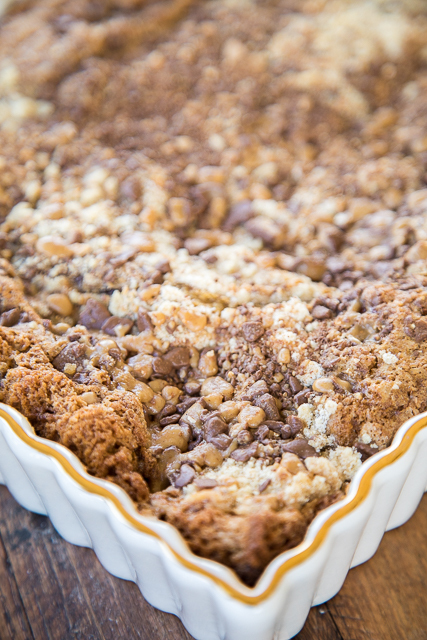 Great for breakfast, brunch, tailgating, potlucks, and even dessert! Can make ahead of time and store in an air-tight container. Flour, brown sugar, sugar, butter, buttermilk, egg, vanilla and chocolate toffee bits. YUM! Everyone RAVES about this yummy coffee cake! 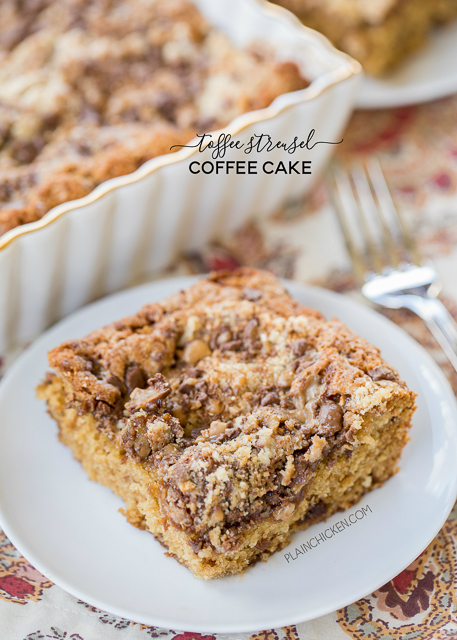 Everyone needs a good coffee cake recipe, and this Toffee Streusel Coffee Cake is my new go-to coffee cake recipe! OMG! It was incredibly delicious! We LOVED the chocolate toffee bits that were sprinkled all over the top of the cake. 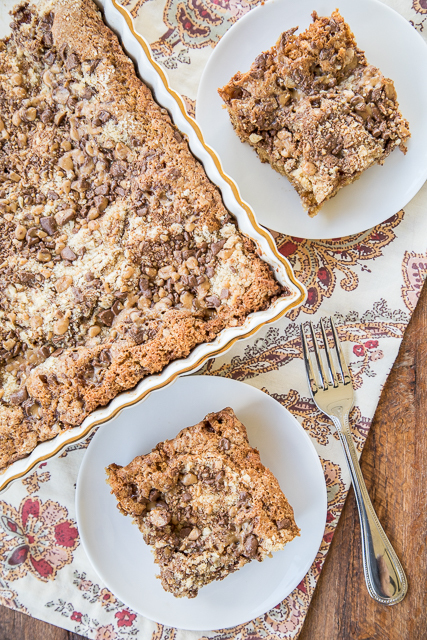 This Toffee Streusel Coffee Cake is perfect for breakfast, afternoon snack or even dessert. The batter of this cake is made with buttermilk. I love to make homemade cornbread and always have some buttermilk in the fridge. This cake is a great way to use up the leftover buttermilk! If you don't have any buttermilk on hand, you can make your own with 1 cup of milk and either a tablespoon of lemon juice or a tablespoon of white vinegar. Just combine the two ingredients and let it sit for 5 or 10 minutes. Boom! Buttermilk! Toffee Streusel Coffee Cake is one of our favorites. It is great for overnight guests, potlucks, brunch, tailgating, really any meal! Give it a try ASAP! I promise you won't be disappointed. In a large bowl, combine flour, brown sugar, sugar and salt. Cut in cold butter until crumbly. Set aside 1/2 cup of mixture for topping. Add baking soda into remaining butter mixture. Stir in egg, vanilla and buttermilk. Stir just until moistened. Top batter with reserved crumb topping. Sprinkle toffee bits on top of cake. Bake for 30 to 35 minutes, until a wooden skewer comes out clean. Cool on wire rack. This looks so delicious! I love a good coffee cake recipe. Thanks for sharing.